The USA has some of the best gay destinations in the world. Despite the bad press it has received recently, there are many pink havens here ranging from San Francisco, New York, Key West and Fire Island. We always love visiting the States and always feel very comfortable travelling here as a gay couple. Chinese travellers visiting the US has increased exponentially over the past few years, with more and more gay Chinese travellers also choosing the US for their vacation, with companies like Cuke Travel and Blue Ribbon servicing the Chinese LGBTQ travel community. These are our 5 tips for Chinese gay travellers visiting the USA to make their travel easier and more enjoyable. Chinese travellers heading to the US will need to complete the EVUS application form beforehand. If travelling to the US as a “visitor”, you will be eligible for a tourist visa. Tourist visas are the ideal category to apply for because they are processed much quicker than other visa types – around 24 hours, and no more than 72 hours. Your visa is then emailed to you, which saves time. To qualify for a tourist visa, you need to state that the reason for travelling to the US is tourism, you have Chinese citizenship, and all supporting documents requested in the application form are included. Travel insurance is a must…don’t even dare think about whether you should or shouldn’t bother. Everyone should have it, end of discussion! Whether you’re planning a mini break, long term trip, extreme adventure experience or just some good old fashioned beach time, insurance is a must. We love World Nomads because their prices are competitive, and you can submit your claims online, which saves a lot of time. World Nomads also offer competitive quotes for Chinese citizens. The USA has some of the best gay parties happening throughout the year, which you may want to time your visit around. During the winter, look out for some of the big gay ski parties taking place, like the Aspen Ski Week in Colorado every January, and the Elevation Utah every February. During the summer months, particularly in June, look out for some of the best gay pride events in the world, like San Francisco Pride, and New York Pride, both in June. Autumn also has its fair share of events worth planning your trip around. For example, in September, check out the Folsom Street Fair in San Francisco – the largest leather event in the world. Throughout the year, the Walt Disney World in Orlando, Florida hosts various unofficial Gay Days, which are a lot of fun. Check the Gay Days' website for more information about when the events are taking place. Guess who went to Gay Days at Disney World Florida? The main currency used in the US is of course the US dollar, and 1 USD$ converts to around 6 Chinese Yuan. We love the XE Currency app for conversions, which we recommend you download prior to your trip. For online currency conversions, we prefer Transferwise to Paypal due to the better exchange rate you get, and much lower fees. 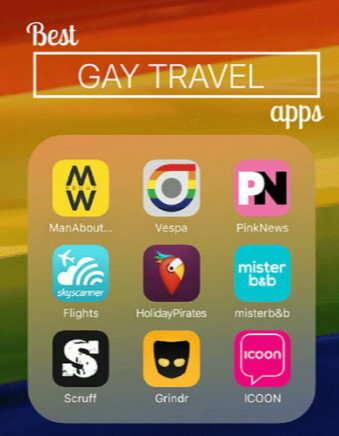 For more practical tips, check out our favourite gay travel mobile apps and 5 best apps for gay travellers. Overall, you should have no problem finding a double bed in hotels in the USA. Most places are used to welcoming gay couples and won't bat an eyelid. We always however advise emailing/calling ahead to double check they are ok to host a gay couple, just to be on the safe side. Booking.com: because it has a huge selection to choose from, usually showing the best online deals. Also, the more you use it, the better the deals become. For example, after a few bookings, you become a genius member, allowing you to get an extra 10-15% off the displayed rates. TripAdvisor: useful for finding out about a specific hotel before booking it. Accommodation listings are ranked according to reviews of previous customers. We particularly love TripAdvisor because you can sometimes find hidden gems, which you wouldn’t normally see on large booking engines such as Booking.com. Purple Roofs: is a massive online portal, listing all the gay friendly hotels around the world. It does not have an online booking system but it is a useful tool to research for exclusively gay accommodations for a specific area. Airbnb: Airbnb revolutionised how we book our accommodation, now allowing you to rent a room with a local or an entire apartment. Sadly, it lacks the option to filter results to identify whether your host is gay friendly. Nonetheless, we never experienced any homophobia from hosts when renting an entire apartment. Misterbnb: Misterbnb is the Airbnb equivalent for the LGBT community. Unlike Airbnb you know your host is gay (or at least gay friendly) and it’s a great way to connect and meet with a gay local who is likely to show you round. You can read more from our Florida trip in our article about our 5 favourite rides at Universal Studios.